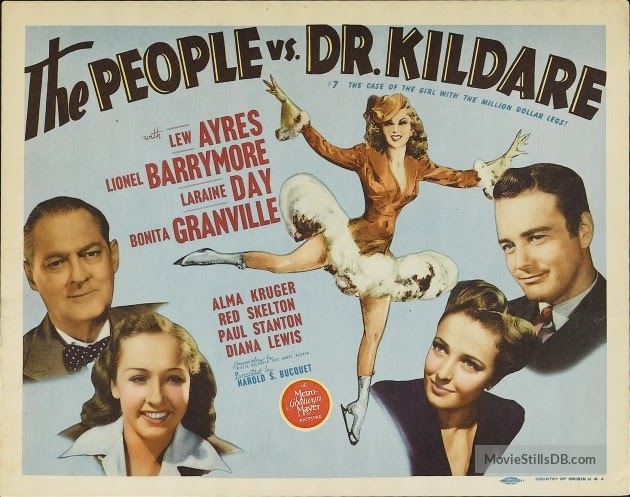 Time to return to the adventures of Dr. James Kildare in THE PEOPLE VS. DR. KILDARE (1941), the seventh film in the Warner Archive's Dr. Kildare Movie Collection. Was there ever a doctor who attracted as many problems as Jimmy Kildare (Lew Ayres)? Probably not! This time around the good doctor and his fiancee, Nurse Mary Lamont (Laraine Day), are on a drive when they come across a serious car accident involving figure skater Frances Marlowe (Bonita Granville). Frances is so badly injured that Dr. Kildare must operate on her spleen right at the accident site (! ); that aspect goes well, but after a couple of months in a cast, it transpires that her broken leg is paralyzed. She sues Dr. Kildare and the hospital for $100,000. 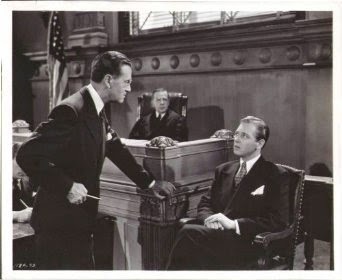 During the course of a well-presented trial, Jimmy comes to realize a possible rare cause of the paralysis and a potential cure. The only remaining question is whether Frances would rather win the trial or be potentially cured. Given the fact that Dr. Kildare has often created his own problems in the past, it was a nice change of pace that this time around he did everything right and it was a fluke of nature which caused the problem. The film has a particularly nice cast, including Granville, who makes the most of her role, as well as Diana Lewis as a fellow skater. Lewis had become Mrs. William Powell in 1940, a union which would last until Powell's passing in 1984. It was an especially nice surprise to have the Falcon himself, Tom Conway, turn up in a substantial role as the hospital defense attorney. 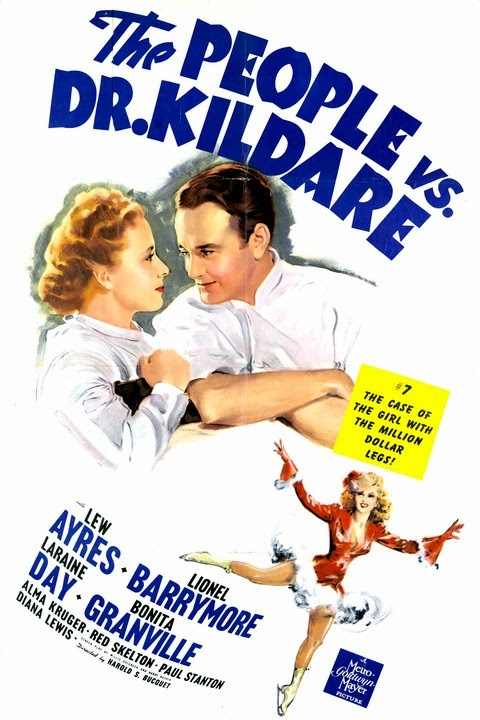 Dr. Kildare's parents aren't on hand for this entry, but otherwise the film rounds up most of the usual cast members, including Lionel Barrymore, Alma Kruger, Walter Kingsford, Nell Craig, Marie Blake, George Reed, Frank Orth, Eddie Acuff, Barbara Bedford, and Gladys Blake. Red Skelton makes the first of his two appearances in the series in this film, as orderly Vernon Briggs. Nat Pendleton is MIA as orderly Joe Wayman, nor would he be in Ayres' last two films in the series, but he returns for a few more films in CALLING DR. GILLESPIE (1942). 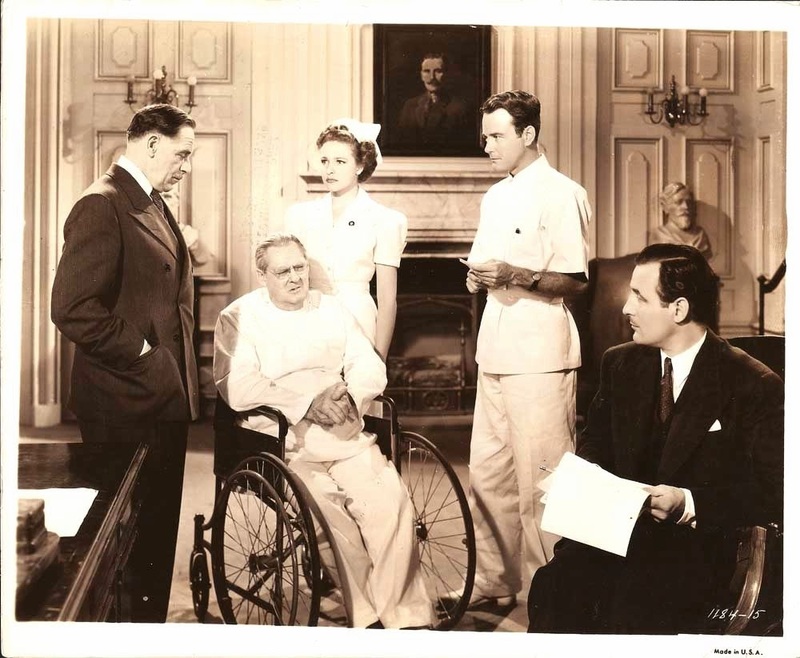 The policeman at the accident scene is Grant Withers (SINNERS' HOLIDAY), and watch for Bess Flowers as the nurse who assists Granville in the courtroom scenes. THE PEOPLE VS. DR. KILDARE was directed by the series' longtime director, Harold S. Bucquet. It was filmed by Clyde De Vinna. The movie runs 78 minutes. Longtime fans of the Kildare series will note this film has new artwork during the opening titles sequence. THE PEOPLE VS. DR. KILDARE is typical of the good-looking prints in this collection. There are a couple brief scenes which have noticeable scratches but for the most part the print's in great shape. The trailer is included. There are just two films left to go in this set, and then I'll be turning my attention to the Warner Archive's follow-up set, the Dr. Gillespie Film Collection. 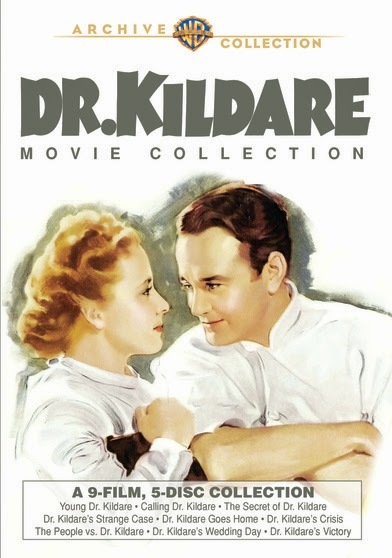 Previously reviewed films also available in the Warner Archive's Dr. Kildare Movie Collection: YOUNG DR. KILDARE (1938), CALLING DR. KILDARE (1939), THE SECRET OF DR. KILDARE (1939), DR. KILDARE'S STRANGE CASE (1940), DR. KILDARE GOES HOME (1940), and DR. KILDARE'S CRISIS (1940). Thanks to the Warner Archive for providing a review copy of this DVD collection. Warner Archive releases are MOD (manufactured on demand) and may be ordered at the WB Shop. Please note that the initial sets of this series sold by the WB Shop are traditionally replicated (pressed) rather than burned on demand. Gee, Red only played Vernon in two of the movies? It feels like more. I'm fond of Red, but I really missed Nat Pendleton. I've been slowly watching the Kildare movies in order. Oddly enough--since I've been a film buff for 45 years--I'd never seen one until this year! Most enjoyable and so strange to see the running subplots and recurring characters. Continuity was never a strong point of most film series.